Hello friends, there are billion of users around the world widely used smartphone. Most of the mobile manufacturer companies launched latest technology smartphone which provide great features. Most of the person download apps from Google Play Store or other locations on free of cost which decrease your smartphone speed. So, today we have to discuss few important tips to increase internal memory of your smartphone. These tips are very useful all those users who are facing speed problem with his smartphone. We know that smartphone have limited internal memory and if you download, install lot of apps on your smartphone then your smartphone speed is slow down. Your smartphone is cluttered up with lot of virus during surfing the internet and downloading different apps. These apps and virus take lot of space in your phone memory and increase the quantity of junk files, shortcuts, unwanted folders and many more. 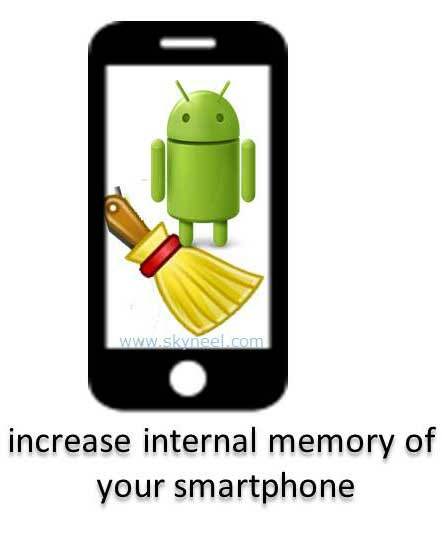 So, let start few important tips and tricks from which you can easily increase internal memory of your smartphone. It is the best way after clearing the Cache of your smartphone you can easily increase internal memory of your smartphone. Most of the person don’t know how to clear the cache memory of your smartphone. To clear the cache memory of your smartphone tap on the Settings > Manage Apps > tap on All option and select clear cache option. After that all junk files and folder are removed from your smartphone which occupied lot of space on internal memory of your smartphone. There are lot of free to download apps e.g. clean master app. You can use these third party apps to clear cache from your smartphone and these apps are available on free of cost on Google Play Store. If you download and installed lot of apps in your smartphone then it will occupied lot of space on your smartphone internal memory. To overcome this type of situation you must have to move all unused apps from internal storage memory of your smartphone to SD card. SD Card have enough space to store all these apps and your internal memory is free which boost up your smartphone. If you want to move apps to SD card then go for the “Setting” option > Tap on the Manage Apps option > Select one or more apps which you want to move into SD Card > Now, tape on the Move to SD Card option. After that all apps transfer from internal memory to SD Card and this trick increase internal memory of your smartphone. Most of the users open lots of program or apps during using his smartphone. When more than programs running in background process they will consume lot of space of your phone internal memory so that smartphone speed will be decreased. When you press home button on you smartphone you will get list of all running apps or programs. If you want to close these apps then you must have to swap these apps one by one either in left or right side. It will close unused running program and your smartphone will work faster. Most of the time your smartphone is cluttered up with lots of virus. These virus enter your smartphone during surfing on the internet. These virus not only harmful for your but also reduce the speed of your smartphone. If you want to overcome that type of problem then first you must have to install any antivirus on your smartphone. After installing antivirus in your smartphone when any virus attack on your smartphone during surfing on the internet, it will automatically search and remove from your phone and increase the speed your smartphone. Most of the time lots of user store different documents, personal of official images, audio or videos and many more things which not only reduce storage space capacity but also reduce speed of your smartphone. To overcome this problem you must have to use cloud storage just like Dropbox, SkyDrive and Google Drive. The Cloud storage facility is used to store large documents, images, audio, videos and other things which is important for you. This is one of the great way to increase internal memory of your smartphone which boost up your smartphone. If you store your important files, images and other things on any cloud storage then you will be able to share them from your smartphone to the cloud and also able to access these files from your computer, laptop or smartphone. I hope you like this article, kindly give your important suggestions in the comment box regarding this article because lots of persons face that situation and after reading this article you must use these given Tips to increase internal memory of your smartphone and also boost up your smartphone. Kindly share your knowledge with your friends, colleague, family members and others. Thanks to all.